A dynamic pop-up is a powerful tool for gaining valuable information about your website visitors such as their email address, name, zip code, etc. 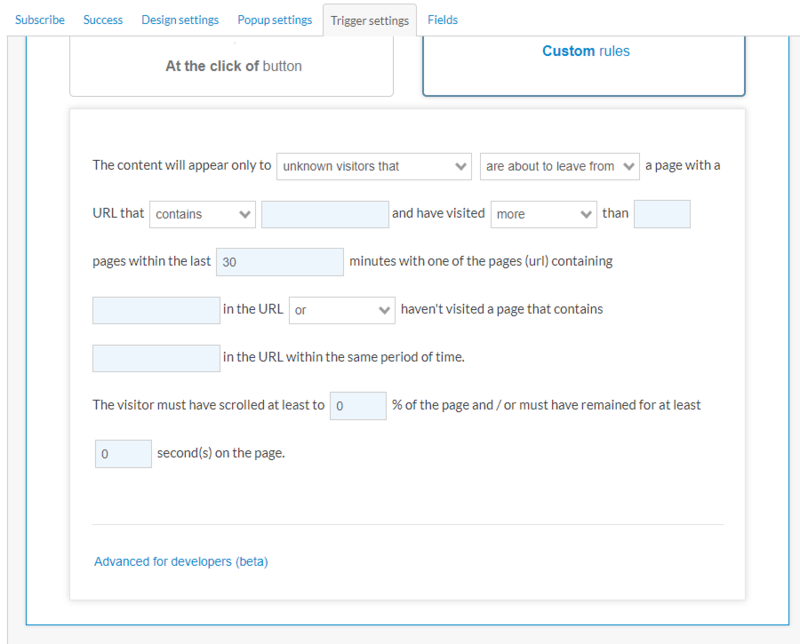 It appears automatically to unknown and known visitors either right when the visitor loads the URL on his browser or when he attempts to leave the website (yeap, ContactPigeon platform can identify that). In the context of e-commerce, pop-ups can be used to offer a discount or a promo code for the next purchase in exchange for the information that the user will provide. 1. 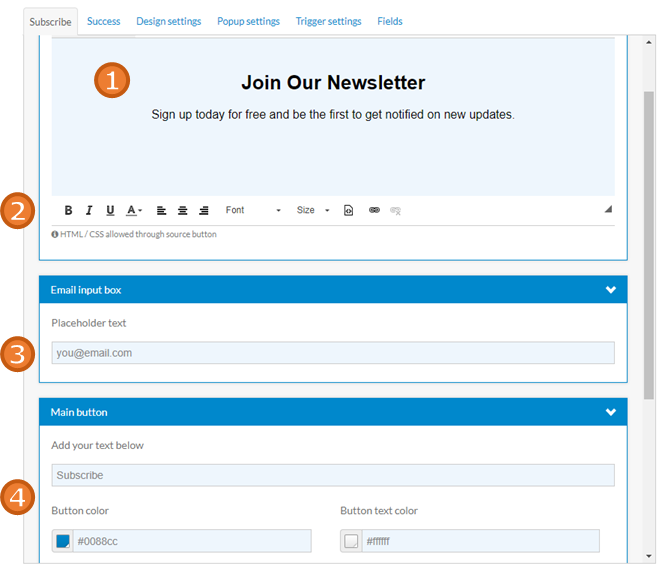 Email Sign-up Form: Use this type when you want users to fill a form (usually giving their email address). In this case, you have 2 previews, one for the CTA page and one for the Success page. 2. Classic Pop-up: This is a simple case when the pop-up contains a message and a button with a link. 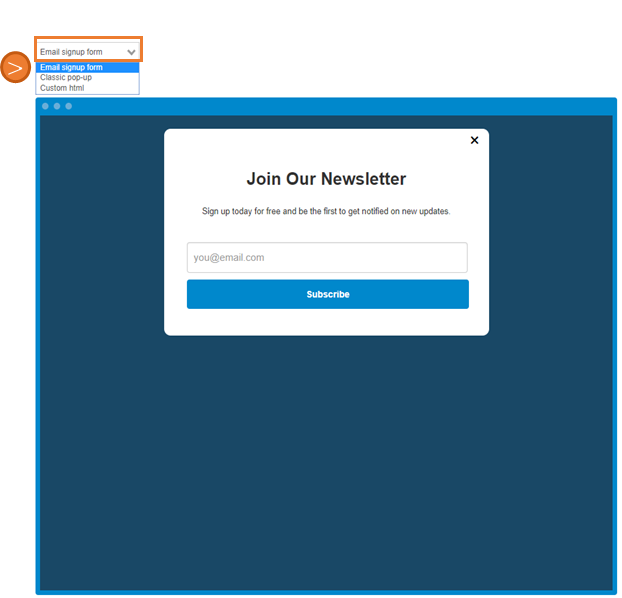 You can use this kind of pop-ups for communicating something specific to your audience or navigating users to specific landing pages. 3. Custom HTML: There is the option also to import your custom HTML in order to tailor the pop-ups to the look and feel of your website. Probably the most common type of Pop-ups is the Sign-up Form. You can create such a pop-up easily by performing the following steps. Step.1: Choose design settings. 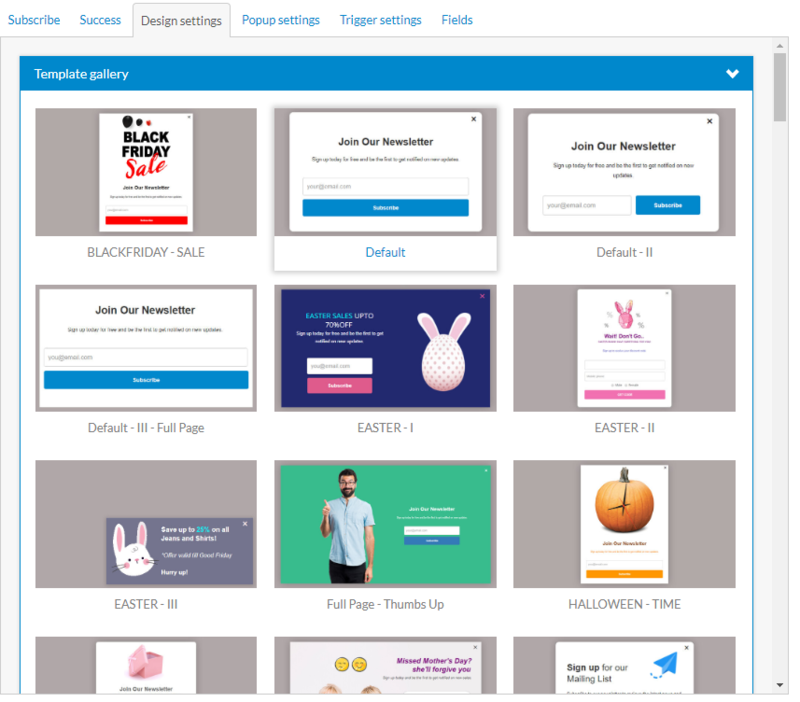 You can either pick a template through our gallery or choose the default one. 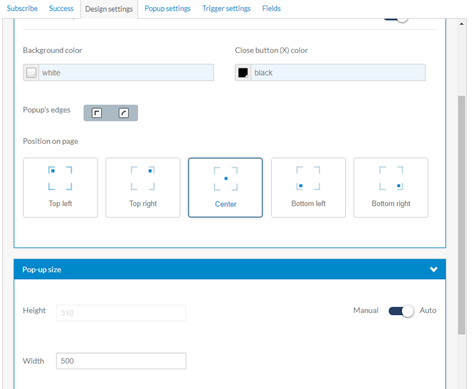 You can perform various adjustments to the design of the pop-up such as picking the background image of your choice, changing dimensions, color, height etc. 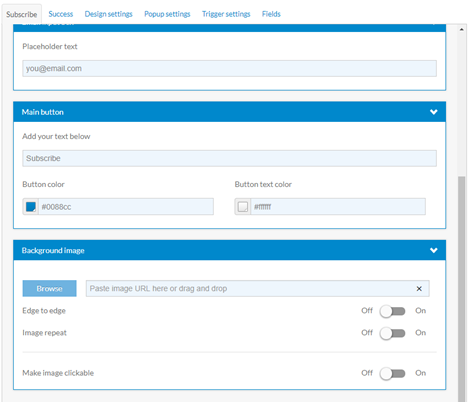 You can easily add or remove fields by going to the Fields tab and activate or deactivate the type of field you want. 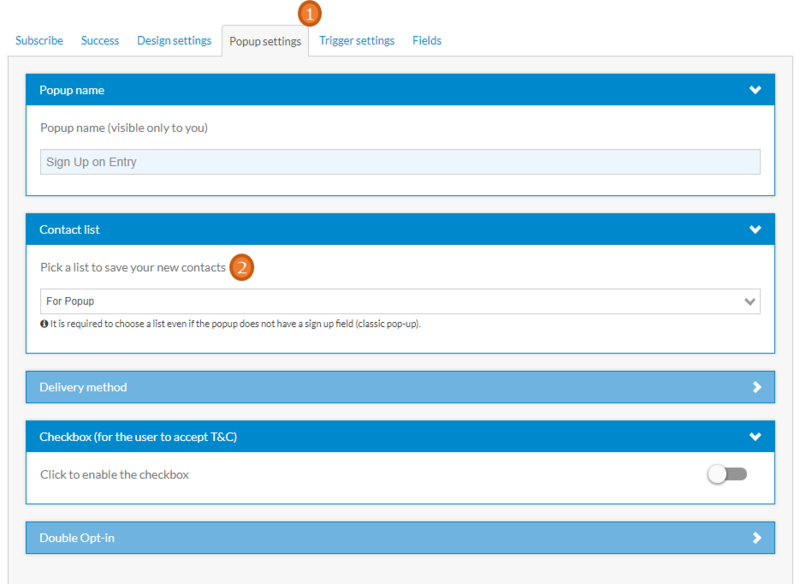 There is also the possibility to create your own custom fields just by activating the Custom field 1, 2, 3 and giving the respective names. It's very important to have predefined the list you want to save your newly acquired emails. You can create a list under the name "For Popup" where you will save your new contacts (for more info about this check this article ). Then move to the Popup settings tab in the editor and from the Contact list, drop-down menu, select the list to which new contact will be saved. On Exit - unknown visitors: The pop-up appears to unknown (no email) visitors when they move the mouse towards the exit button of the browser. On Load - unknown visitors: The pop-up appears to unknown visitors when they load a page of your website in their browser. On Exit - known visitors: The pop-up appears to known visitors when they move the mouse towards the exit button of the browser. On Load - known visitor: The pop-up appears to known visitors when they load a page of your website in their browser. At the click of button: The pop-up appears to either the known or the unknown visitors when they have clicked on a specific class or id point. At the same time, you can choose also if you want your visitor to have added/haven't added something to his basket. Please Note: The exit-intent feature does not work for mobile devices. Last but least, don't forget to preview your pop-up, then click the "Save changes" button on the upper right side of the editor, turn on the activation button and just click again the "Save changes" button and your pop-up is ready!